The creators of the new Orlan-MKS space suit, which is equipped with a unique automatic thermoregulation system, plan to send it to space by the end of the year. The Orlan-MKS space suit was the main attraction at the Innoprom International Industrial Trade Fair held in Yekaterinburg from July 8-11. Companies hailing from 70 countries around the world participated in the event, however, the Russian space suit set an expo record for popularity as measured by the quantity of people that wanted to take selfies with it. The organizers lost count, but believe the number was somewhere in the thousands. The space suit was ordered by RKK Energia, the main supplier of components and equipment of the Russian segment of the International Space Station (ISS). The testing of the new system, which is supposed to end by the end of 2015, is being done according to 50 parameters. 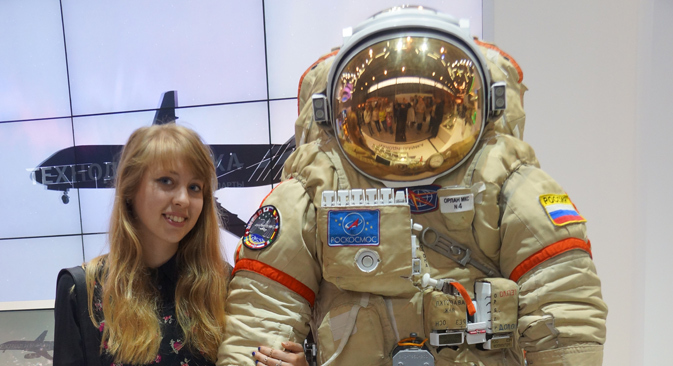 The creator of the new space suit, the Russian Technodynamica Holding (a subsidiary of the state Rostech corporation) brought the suit to the exhibition straight from Zvezda’s – the suit’s developers – testing facilities. Presenting the novelty, Maxim Kuzyuk, the holding's general director, said that today this is "the most perfected space suit in the world." The new Russian space suit has three main distinguishing particularities. Most importantly, it has the first automatic thermoregulation system in the world, which ensures that astronauts do not get distracted by monitoring and regulating their own body temperature while working in space. The suit’s computer can control their temperature and create optimal conditions. "It is very difficult to measure the astronaut's condition and enter the data into the cooling or heating system,” said a representative from Technodynamica. “No one in the world has yet been able to develop an algorithm with the correct sensor location." If the computer system suddenly fails the space suit is equipped with a manual control, increasing its dependability. The second unique feature of the suit is its use of polyurethane sealed enclosures, which are lighter and more resistant, instead of rubber ones. This helps increase the length of service for the suit from 15 to 20 outings in open space and extend its use from four to five years. Due to its special design, the astronaut can easily put the space suit on in about 5-7 minutes without any help. Until recently putting on a space suit was quite an ordeal talking almost an hour and requiring the help of colleagues. Additionally, previous space suits could maintain full pressure in the case of rupture for only 30 minutes, while the Orlan-MKS can keep the suit pressurized for 50 minutes in such instances. In the event of an emergency or as needed, all necessary data appears on a liquid-crystal display screen. According to a representative from Technodynamica, currently only Russian astronauts preparing to work on the ISS are testing suits from this line. "Space technologies are similar to military technologies and are sometimes even more secret, which is why international cooperation in this field is a complicated process," the representative said. If the testing is successful, a new moon suit can be developed based on the Orlan-MKS.